Courtesy of FUTURE HOME REALTY INC. 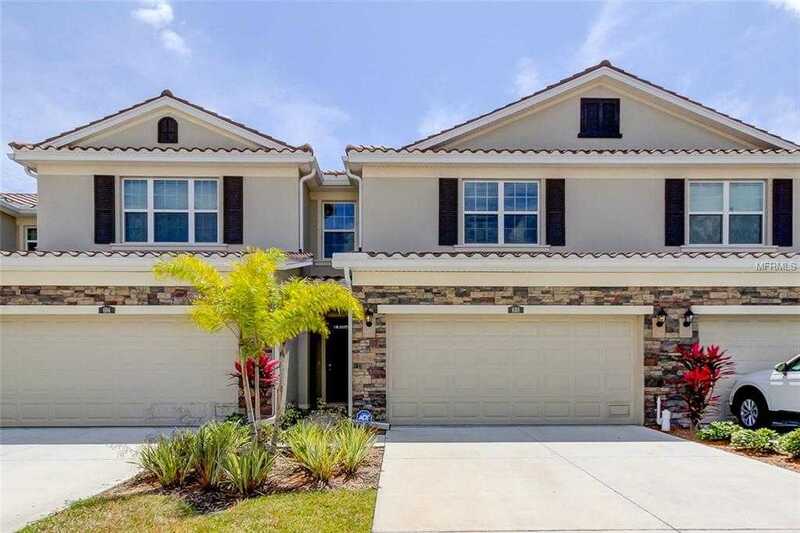 This townhouse is located in the beautiful Colonnade community and offers a gorgeous Ashton 3 bedroom floor plan with a 2 car garage & a beautiful tile barrel roof. Amenities include relaxing outdoor pool cabana with fire pit & grill as well as a community park. This 3/2.5/2 Townhouse is ALL BLOCK construction with Hurricane Shutters. This roomy home feels more like a single-family home with an open concept kitchen, large family room with custom built accent wood wall, and casual dining area connected to a covered lanai. The finely appointed kitchen features a large island perfect for bar-style eating or entertaining, pantry, plenty of counter space, and 36 8221; cabinets with crown molding. This beautiful home is complete with stainless steel kitchen appliances including side-by-side refrigerator, built-in dishwasher, electric range, and microwave hood. Downstairs there is also a powder bath and a two-car garage. The Owner 8217;s Suite includes a large bedroom, walk-in closet, double vanity, large corner shower, and separate linen closet. A loft provides an extra area for work or play, and two other bedrooms, both with walk-in closets and ceiling fans with lights, share a second bath. Enjoy convenient access to the upstairs laundry room. Additional upgrades include, ADT Pulse security system with DVR and 3 cameras plus a MyQ Smart Garage Door opener. Don’t miss your opportunity to see this gorgeous townhouse located close to beautiful downtown St. Pete filled with restaurants, shopping and beautiful water views!! Please, send me more information on this property: MLS# T3167403 – $379,900 – 608 52nd Ter N, St Petersburg, FL 33703. I would like to schedule a showing appointment for this property: MLS# T3167403 – $379,900 – 608 52nd Ter N, St Petersburg, FL 33703.